Do you see this comb in the picture? Does it look like any regular comb to you? If it does, that's because you're an absolute sane and balanced person. However, this is my only comb and the loss of it this morning led me down a spiral of pessimism, anguish and despair to the point of making me wonder what the less painful and cheapest way to commit suicide could be. OK, I'm being a bit dramatic here but that's just because this is the beginning of this story of sorrow called: THE TRAGEDY OF THE COMB! When yesterday I was jogging around Arthur's Seat, with the sun in my face, seeing the ducks and swans in the lake, listening to the birds singing, I had no idea how one day later I would be considering suicide due to the loss of a comb. But this is a tragedy in four acts, so let us start with the first act. This tragedy starts when I realised that I had gone bankrupt in the UK. OK, not really bankrupt, just out of money in my current account. I still have a savings account but I don't want to touch that one until the end of the PhD... So I tried to transfer money from my Macau account and couldn't because they changed the procedure. Now they will text you a one time code every time one needs to transfer and the text just wouldn't come! I realised with utter distressed that I was a bankrupt man! I would need to cal the bank the next morning (today). It was at the same time that I realised that I was virtually bankrupt in the country of Her British Majesty while having enough money to last me one year in the gambling capital of the world, that I received another tragic financial news. I wasn't going to get a scholarship that I thought was almost sure. That was very frustrating, specially because I lost two days preparing the application. So I woke up today with this strange feeling that I only have 80p in this country. As every day, I go to the kitchen to eat an orange when I realised that was my last orange! I would need to buy oranges, but how, if I have only 80p left? Now, the act of eating my morning orange is almost sacred because it's when I say my morning prayer. Today, however, there was no morning prayer, there was just the anguish of being bankrupt and without oranges! When I lived in Macau, I was totally used to cal the bank. It's not an easy procedure, mind you! You need to wait on hold, need to understand the Chinese accent of the person on the other side of the line and need to know that there will be some complication. However, after almost two years in Edinburgh, I lost this practise. Today it took 7 minutes to be attended, I couldn't understand the lady and they wanted me to remember a phone number I haven't used in 2 years! I finally managed to change my number with the bank but this will take one day to process. Oh stress! Only one thing could save me from mental collapse: one hour in the gym not thinking about my worries. And that's when the comb comes into the picture! While preparing my bag to the gym, I realised I had lost my comb! 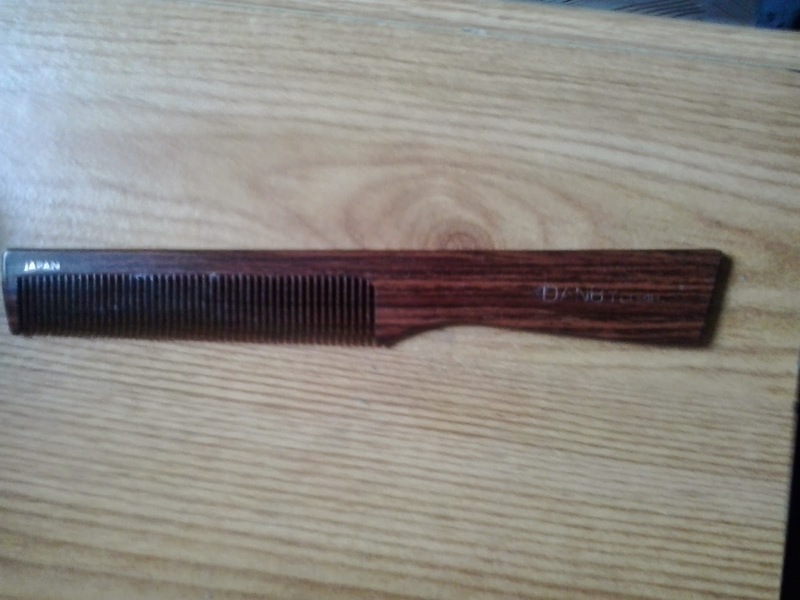 Problem 1: it's the only comb I have. Problem 2: I don't have the money to buy a new one. Problem 3: my hair is really long at the moment because I'm waiting to go to Portugal in a couple of weeks to cut it (much cheaper!) so I really need the comb not to look like the beggar I'm about the become. I searched and searched and there was no way to find the comb. I gave up going to the gym and decided to tide my room instead as it was already a vision of hell. Still, no comb! I lift the bed: could only find a book in German from my predecessor in the room. It was by that time that I thought with despair that I couldn't even go to the pharmacy and buy enough pills to commit suicide because a) I have no idea what pills to buy and b) if I had enough money to buy enough pills to kill myself, I would rather buy a comb and oranges instead. Finally I found the comb! It was under the drawer. Probably fell and I kicked it there or something like that. That's when I realised that all my problems would soon be solved. I can just use my Macau card to withdraw money in an ATM that will serve me while the transference doesn't come through. If that doesn't work, the Portuguese card will. If that still doesn´t work, I have good friends in Edinburgh that can lend me money for 4 or 5 days - my flatmate had already proposed that when he saw my utter despair because of the lost comb. And if, worst case scenario, I really can't make the transference from Macau, my savings account here will be enough for 2 months and the payment for my classes will arrive in a week or two. How easier is it to rationalise your problems when you have a comb at hand!